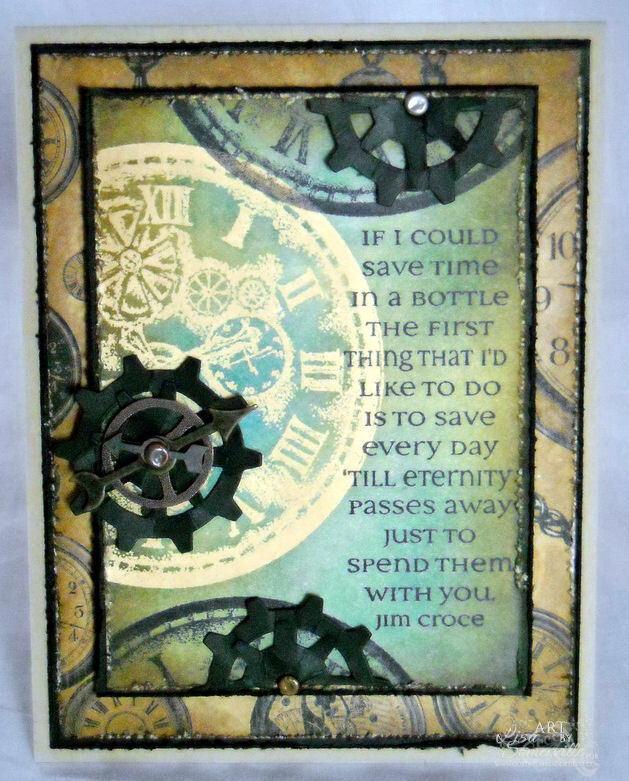 I don't always have time to play along with Linda's Grungy Monday Challenges, but when I saw this weeks challenge that uses this technique from 2008 by Tim Holtz, I knew it would be perfect to use with some of Our Daily Bread Designs new June Releases. The Clock face is from the ODBD Time plate, don't you just love the vintage look! I'm a Jim Croce Fan, so I was thrilled to see Save Time was one of the new sets in The Blessings Line of stamps. 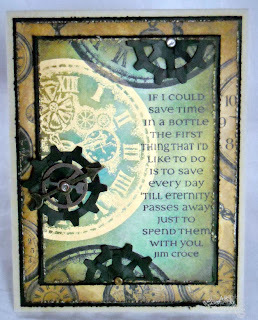 I added some metal Idea-ology Gears and also some Tim Holtz Die Cut gears to embellish my card. Makes for a great Masculine card - perfect for the hubby for FD, or an anniversary! Stunning card - love your colours and embellishments. It all works so well together. Great card! You rocked that challenge big time, luv the tech and the gears! So pretty. I love the colours. So eye catching. A Million Thank yous to you! First of all, this is such a great technique! And, I just learned that TH Distress Inks are embossable and that I can use it directly on a stamp, too?! his adds so many colors to my collection for coloring! Where have I been?! Is there a URL where TH lists several techniques, that you know of? I need more colors, that is for sure! Thank you so much for posting the link to that technique! Now, about your card...I think it looks even better than his! I love that you added the metal gears, the way they pop off the card is amazing looking! Of course, the lyrics are a fabulous addition, I love this stamp, it is on my list. I love that song, too. I like the colors you chose very much...and what a great Anniversary or FD card you do have to give! What a fortunate guy! If I miss your Anniversary...have a fabulous one! How Wonderful! Love the background effect! Fabulous! Love that sentiment too! You know I am loving this! Fabulous Grungy Monday creation! One of my favorite techniques! I love the gears on this, it looks fabulous! Wow...awesome!! Would look great in the booth, too...LOL!! This is one terrific piece, Lisa! Love the theme...and all those distressed edges. Of course, the color is one of my favorites, as well. Oh, wow! This is awesome, Lisa! Love the song verse and love the gears and clock face. Such a perfect design for a masculine card. Thanks for sharing this with us at The Kraft Journal. WOW! Very nice card! i love everything about it. Fabulous card! Thank you for joining our Father’s Day or Masculine challenge at Sentimental Sundays . I love your card. Perfect colors for your stamps. Embellishments were very creative. Wonderfully done! Thanks for sharing with us at The Stamping Boutique. stunning - loving your style. fabulous card and the perfect colour combination. The clock face looks amazing and I really like the sentiment. Thank you for sharing your work with us at Simon Says Stamp and Show. Thanks so much for joining us again at The Kraft Journal... I love this masculine car and that clock face is gorgeous...great color combo too! this is gorgeous! Love the images and the colors, great masculine card. Great technique! Love the images and design! Love Jim Croce! Great card, love the look of the gears. Thanks for joining us at Sweet Stamps. Great card! love the stamps you used. Wow this is an awesome card. The clock stamp is to die for. The colors are great. Well done. The batik effect is very nice and I love your time in a bottle. awesome, it looks so masculine! This is a fantastic card! It has a genuinely masculine vibe to it and I just love the sentiment! I'm so glad that you joined us at Sentimental Sundays Father's Day or a Masculine Card Challenge and I hope we see more of your creations in the future! Lisa, this is absolutely beautiful! I love that you used the Jim Croce lyrics, and the design you built around them is absolutely perfect, as is your use of this Tim technique. You never fail to inspire!